Trijicon Inc. says it will "stop putting references to scripture on all products manufactured for the U.S. military." (CNN) -- A manufacturer that has been inscribing Bible references on rifle sights used by U.S. troops in Iraq and Afghanistan announced Thursday that it will stop putting scripture references on products the U.S. military uses. Gen. David Petraeus, commander of United States Central Command, said Wednesday -- apparently before learning of the company's announcement -- that the references were a "big concern" to the U.S. Army and the U.S. Marine Corps, which have contracts for the scopes. "I hope you can sense ... this is of serious concern to me and the other commanders in Iraq and Afghanistan because it can indeed create a perception that is absolutely contrary to what it is that we have sought to do," he said. He said U.S. troops are much more sensitive "about this kind of thing," apparently, than is the contractor involved. On its Web site Wednesday, the Muslim Public Affairs Council said the references "feed into the violent extremists' narrative that the ongoing wars in Afghanistan and Iraq are a 'crusade against Islam.' "
Trijicon Inc., the manufacturer, said in a written statement that it has "offered to voluntarily stop putting references to scripture on all products manufactured for the U.S. military -- and will provide, free of charge, 100 modification kits to the Pentagon to enable the removal of the references that are already on products that are currently deployed." There was no immediate reaction from the Pentagon in response to the announcement, but a response was being prepared, Maj. Shawn Turner in the Department of Defense's public affairs office told CNN. The Marine Corps said it was "concerned" when it learned about the biblical references. "We are making every effort to remove these markings from all of our scopes and will ensure that all future procurement of these scopes will not have these types of markings," it said in a written statement. "We will remove the markings from the scopes currently delivered. Trijicon will also remove the markings from all scopes that have not been delivered." Earlier, after it emerged that the Michigan-based manufacturer was putting codes for scriptures on the scopes, Trijicon issued a statement saying that it has put scripture references on its products for more than two decades. "As long as we have men and women in danger, we will continue to do everything we can to provide them with both state-of-the-art technology and the never-ending support and prayers of a grateful nation," it said Wednesday. ABC first reported the story on Monday, saying that some of the citations on the sights included "2COR4:6," an apparent reference to 2 Corinthians 4:6 of the New Testament, which reads, "For God, who said, 'Let light shine out of darkness,' made his light shine in our hearts to give us the light of the knowledge of the glory of God in the face of Christ." Another, according to ABC, included JN8:12, apparently referring to John 8:12. That reads, "When Jesus spoke again to the people, he said, 'I am the light of the world. Whoever follows me will never walk in darkness, but will have the light of life.' 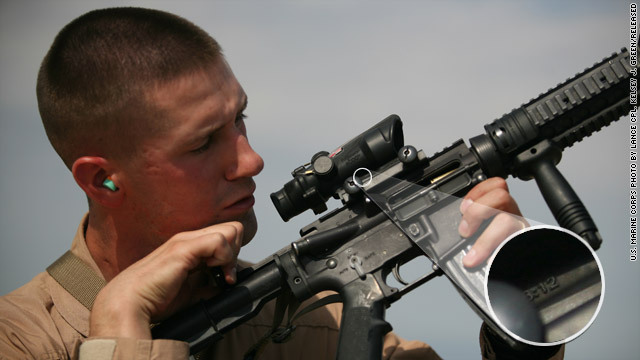 "
Trijicon has a $660 million contract for the U.S. Marine Corps and the U.S. Army, according to Turner. He said slightly more than 300,000 scopes have been delivered so far, with most going to the Marines. After the initial news report, the Muslim Public Affairs Council called on Defense Secretary Robert Gates to withdraw from combat use weapons that have sights with the biblical references. "Allowing religious references to be placed on U.S. weaponry, which are bought and paid for by U.S. taxpayers, is unacceptable," MPAC Executive Director Salam Al-Marayati wrote in a letter to Gates, according to the council's Web site. "Such inscriptions not only run afoul of the Constitution and U.S. military rules, but they also feed into the violent extremists' narrative that the ongoing wars in Afghanistan and Iraq are a 'crusade against Islam.' "